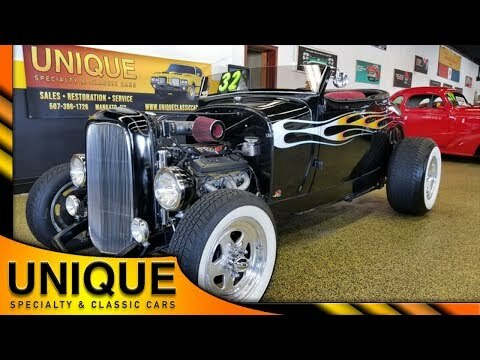 1932 Ford Roadster Street Rod, LT1, TRADES? 1932 Ford Roadster Street Rod with a 32 style front end and a 29 style body. Powered by an LT1 with a dual snorkel intake paired with a 6 speed manual transmission. Old school flame paint job from white to red gradient. Disc brakes up front and drums on the rear wheels. Polished aluminum wheels with wide white walled tires. Gas tank on the rear and dual exhausts coming out of the rear. The paint has a nice luster as well as pin-striping. Classic red interior that makes the car look very nice. Tilt column and VDL gauges. Carpeting and door cards are in great shape. Grant steering wheel. Pin striping on the dash as well to match the exterior. Just a great looking running and driving Street Rod with great looking classic styling.